Can I bring outside food into the park? Yes! Please remember the following is not permitted: Any alcoholic drinks, glass containers of any kind, open fires or gas braai’s. We do have snack vending machines available that sells coffee, bottled water, canned soda drinks, sweets and chips. Can I bring my own lifejacket or floaties (water wings)? Yes! We also provide Type III life vests in a variety of sizes free of charge. Floatation devices such as noodles, in-suit floatation devices, personal swim rings/floats and boogie boards are not permitted. Can I bring my own folding chair / umbrella / gazebo? Yes! If they are securely anchored to the ground. We provide chairs and shade, but they are available on a first come, first serve basis. Gazebos should be no larger than 3m x 3m. Dolphin Beach Entertainment is not responsible for items that are lost, stolen, or damaged. Do I still have to purchase a ticket if I don't plan on getting in the water? Yes! Guests who accompanies children for supervising purposes only pay R10 per person admission. Yes! All our water attractions are usually between 23 and 29 degrees depending on weather conditions. Are towels provided at the water park? No. You have to bring your own beach towels. How old do my kids have to be to come to your park alone? We recommend that all children under 12years be accompanied by a responsible adult over the age of 16. Parents / Guardians can decide if children are responsible enough to visit alone and follow all park rules. Dolphin Beach Entertainment staff does not stop children from exiting the park unattended and we are unable to page guests, so please plan accordingly. Yes! All of our staff undergoes an in-house training course before being appointed. Pool and slide attendants are licensed in water rescues and first aid. Our first aid station is located at the ticket office. We take pride in the safety of our park! Yes! We have special packages available for group events for schools, churches and camps. Yes! Our ticket office accepts Visa and Master Card payments. The closest ATM is 150m walking distance from the front gate of the park. Are there restaurants close to the park? Yes! There are 8 top-class restaurants within sight and walking distance from the park. These restaurants include Steak Restaurants, Sea Food Restaurants, a Greek Restaurant, Coffee Shops and Social Cafés. Can I leave the park and come back later? Yes! As long as you keep the wristband attached to your arm. If you remove it, you will have to pay again. Do you have a “Family Pass”? There will not be a “Family Pass”. All season passes are individual and non-transferable as they have a photo associated with them. What are the perks of a Season Pass? A Season Pass provides the holder with unlimited sliding between 9:00 and 17:00 daily and unlimited number of visits during normal operating hours. It is valid between 1 October to 30 April. One FREE Supervising Mom/Dad Admission Pass per visit. One Bubble Trouble Session per event night. Do you allows drones in the park? Use of drones (in, over, or around the park), whether for photographic purposes or otherwise, is strictly prohibited (unless the user has been granted written, contractual permission for that specific instance from the manager of the park). Violations may subject the user to immediate ejection, confiscation of the drone, and referral of the matter to authorities. Drones are a serious safety hazard to ride operations, park operations (including electrical facilities), and to the park’s guests and personnel. Use of drones in, over or around the park, also constitutes an illegal trespass, an invasion of the park’s privacy, and tortious interference to our operations. No. All purchases are non-refundable and non-exchangeable for any reason after the transaction is complete at the Ticket Office. This includes weather related events. Please check local weather conditions prior to planning your visit. Do you offer any upgrade options? No. All purchases are non-refundable and non-exchangeable for any reason after the transaction is complete at the Ticket Office. Please make sure you read all admission options and deals available before finalizing your purchase. If you have an additional question you would like answered before your visit, feel free to submit an online question here or call our friendly office staff at (082)4454014. 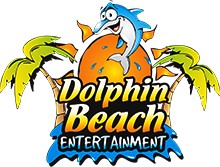 Make your child's next birthday the best at Dolphin Beach Entertainment.